Westport Writers' Workshop will host a reading with four of its authors on Tuesday, Jan. 15 from 7 - 9 p.m. at Music Theatre of CT. The reading is open to the public. A $10 admission fee includes a beverage of choice. 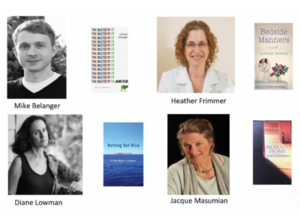 The featured authors are Mike Belanger ("The History of Jane Doe"), Heather Frimmer ("Bedside Manners"), Diane Lowman ("Nothing But Blue"), and Jacque Masumian ("Nobody Home"). Music Theatre of CT is located at 509 Westport Ave. in Norwalk, Conn. For more information, visit musictheatreofct.org.